You know some weeks, everything goes a bit pants, and you end up sniveling into a cherry coke and packet of minstrels while watching The Princess Diaries and cursing boys/mothers/small children with a tendency to poo in inappropriate places? Well, this was not one of those weeks. Because, after 41 years of ceaseless toil (baffling my brother with Crack-A-Joke books and boring my parents and friends by reciting endless lines from Blackadder) I have been declared officially FUNNY. Not by my mother (I do not meet any of her many and varied criteria, including not being Penelope Keith), but by some Very Important People in charge of a Very Important Prize, named after a Very Important Man i.e. Roald Dahl. 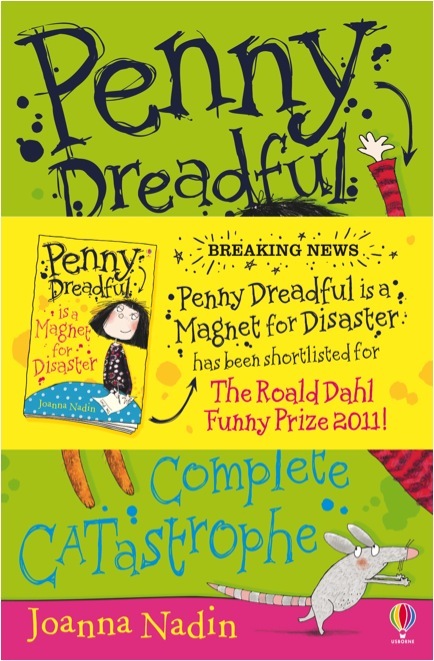 Yes, peeps, I am actually factually on the shortlist for the Roald Dahl prize, or rather Penny Dreadful is, who is quite a lot funnier than me, as well as slightly (but only slightly) shorter, and slightly (but only slightly) more prone to spilling Ribena. Which, like I KNOW. I cried real tears when I found out (in the household cleaner aisle at Morrison’s – though I don’t suppose it is the first time someone has wept in front of a display of Vanish Oxy-Action). Not just because it is massive honour to be called funny (with a capital F), but because once upon a time (1979 to be precise) a geeky little bookworm in a cable knit jumper and corduroy skirt left sleepy (aka dull) Saffron Walden and went all the way to That Big London to a Puffin Club Convention (like chess club, but with worse hair) and met an old man who wrote funny books, books she liked a lot.